Interesting shot, nice take on the challenge. too dark to get any contrast. an original concept though. A little flat, whites are gray. A nice set-up, although I thinking the lighting could have been stronger. I had two friends I use to work with and party with shot theirselves one just last summer. Good idea but shadows are too dark. Too many shadows here, need more light on the gun! A bit on the grey side. Good idea, if a bit depressing! 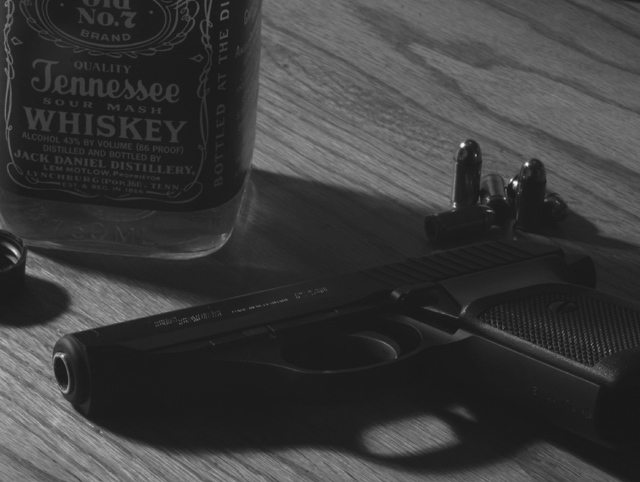 too dark - need some fill lighting from the right - diffused of course, just enought to light the gun and bullets ups a bit - the are in the shadow of the bottle and too hard to make out. Proudly hosted by Sargasso Networks. Current Server Time: 04/20/2019 12:16:58 AM EDT.